Join the discussion on our forums! Come discuss Lotus Assassin over in our dedicated Lotus Assassin discussion topic. For 5000g, you can just give the Jade Lotus any name and they will assassinate and/or embarrass them. Pumped this up to a 7/7 (MEMES) with Shadow Sensei, and traded into 2 Alley Armorsmiths, then proceeded to smack face twice on the turns afterward. Very good card, love this in my stealth burgle rogue! Even tough it competes with Azure Drake, I'm having such a great time with this card. Great sinergy with Shadow Sensei. Against shaman it's a "totem cleaner", against zoo and pirate warrior (if you survive up to turn 5 LOL) you can get at least a couple of favorable trades, and against midrange decks it can force AOE just to remove it. Another expansion and as always another cool/solid rogue 5-drop that I will play but probably won't have a chance to end up competitive because it is competing with azure drake. The only two expansions the class didn't get a 5-drop were Naxx and LoE. Is is so hard to make them a bit bigger or smaller to give people who want to try minion centric decks a chance? "This will surely make Midrange Rogue a strong deck in constructed" -said the increasingly nervous Ben Brode for what must be at least the 16th card so far printed specifically for it. This card contribute to midrange rogue very much. It's both a serious threat and removal with body against weaker minions. It lets you do 2-to-1 trades easily. Would definitely craft to try. Reynad's tempo Rogue had it. When you have coldblood in hand its almost a guaranteed 9 damage. Earthen Ring Farseer just made a new friend. Maybe, but not in current rogue archetypes. It's great, very great card, but how you mind use it? However, druid can now discover it from lotus agents... and, probably, in some situations it would be more efficient than tiger. Decent card, but this makes it easier for others to smorc down thieves. Since everyone discussed the card already, can we just talk about that this expansion spread Pandas like crazy? And I'm really glad for it. After Vanilla and WOTLK, Mists of Pandaria was my third favourite expansion of World of Warcraft and I'm really happy to see more Pandaren characters in the game! The tiger is completely playable, only that in decks with Beast synergy like Secret Hunter or Beast Druid. 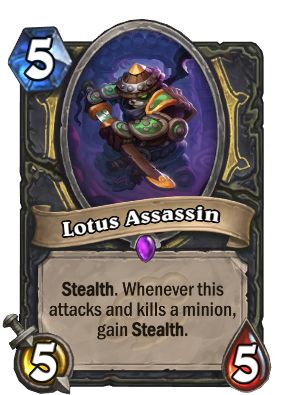 Does he gain stealth after killing enemy hero for BM purposes? Playable and cool, but won't see play in constructed. There's no deck for it. EDIT 21/03/2017: So this did end up seeing no Tier 1/2 play, right?